The National Arboretum Canberra (250 hectares) was created after the devastating bushfires which raged through this area in 2003. Prior to the bushfire this area had a commercial Radiata Pine plantation which went 'off like a rocket' in the fires. It was in 2004 that the ACT Government held a nationwide competition for an arboretum plan which was to be part of the recovery from that bushfire. The winning design by landscape architects Taylor Cullity Lethlean and architects Tonkin Zulaikha Greet proposed 100 forests and 100 gardens focussing on establishing an arboretum to display forests of threatened and/or iconic species from around the world, including Australia. This design also incorporated the cork oak and Himalayan cedar forests which were planted early last century, much of which survived the fires. Experimental plantings, research and education were all to be an integral aspect of this project. Since 2006 the (mostly completed) arboretum has been planted with just a few forests still to be planted. Already this area is evolving into a beautiful patchwork of young forests, many with seasonal interest, displaying new spring growth, flowering, fruiting, autumn colour, shedding bark, attracting birds and insects, so there is always something new and interesting to see. The Arboretum was officially opened to the public in February 2013. It has had many visiting heads of government and ambassadors plant ceremonial trees (trees significant to their own country). 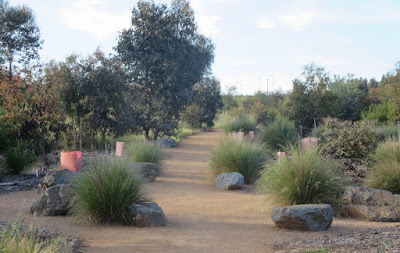 It is located at the western end of Lake Burley Griffin (the Government House end) with beautiful undulating land with fantastic views overlooking the lake towards the city. Sitting atop a hill is the Village Building which is the usual first stop for visitors. Here can be found the information hub, cafe, restaurant and gift shop. It is also the meeting point for guided walks led by volunteer walk guides. Also located in this area is the Bonsai Pavilion, housing the superb National Bonsai and Penjing Collection of Australia. Native and exotic exhibits are rotated so this display is ever changing throughout the seasons. The Canberra Discovery Garden was established by ACTEW Water to help Canberra gardeners better understand climate, soils and geology and assist them in making good, sustainable water-wise choices in plant selection and garden design. The garden is a series of linked garden 'rooms' including a covered outdoor learning area for workshops, talks and school groups etc and an interpretive trail which allows visitors to engage in self directed learning and discovery. The garden design and plant selections aim to inspire visitors to develop healthy, water-wise gardens which are sustainable through solid gardening practices. In the following link Gerrie Mackey writes about an area in the Arboretum - the Southern Tablelands Ecosystem Park. 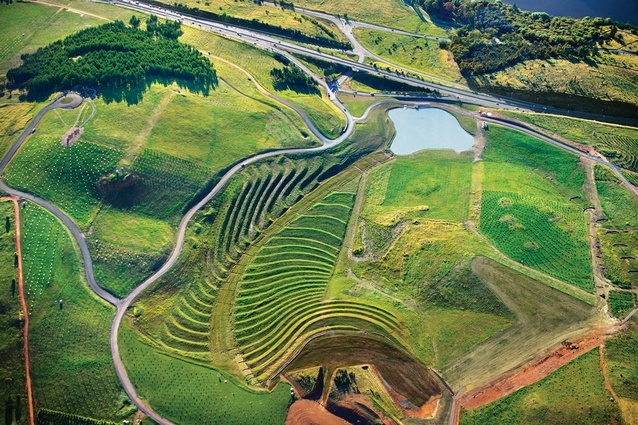 The National Arboretum is a must see if you visit the ACT. To see it now in it's infancy and then to return years later, noting the progress and growth of the trees would be just fantastic.